When it comes to shirts, men have a wide variety of colors, patterns and designs to choose from. 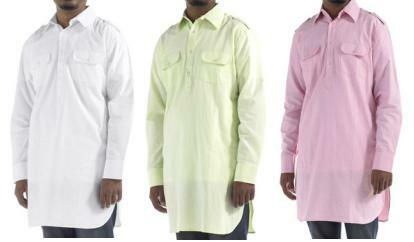 The style of shirts worn by Muslim men are slightly different from others. The shirts they wear are often referred to as kameez. Kameez is longer than other shirts. It normally extends till the thigh of the wearer. The fabric of Islamic shirts is quite thick. Muslim men are not allowed to expose their skin tone to others. Hence Islamic shirts are designed from a thick fabric. The colors of Islamic shirts are never too bright. These shirts do not have any flashy designs or fancy patterns. The fitting of these shirts is considerably loose so that the body figure of wearer stays hidden. With some smart tips, one can look trendy wearing Islamic shirts. Formal shirts look best when paired with tailored jackets or suits and trousers.